It’s that time of year when everyone starts planning summer holidays, whether abroad or at home, going away to visit family, or making the all important trip home for summer from university. 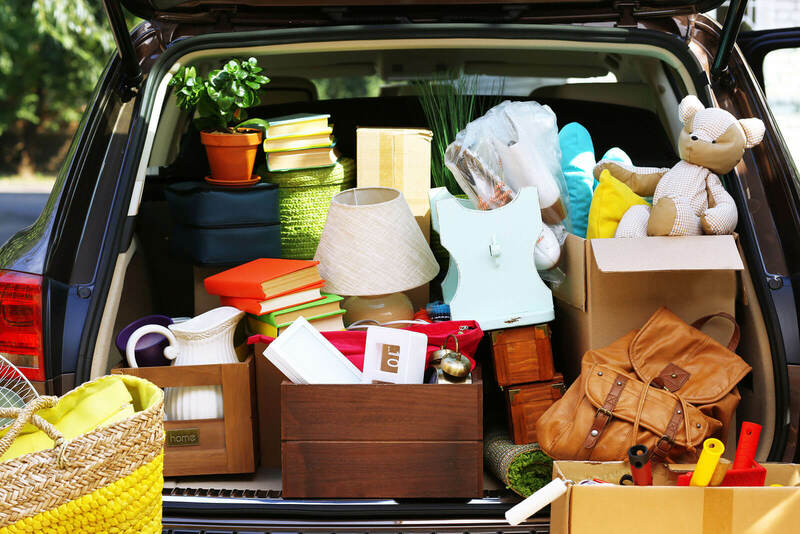 With lots of these journeys comes a carload of stuff that you need to take with you, and you may not have realised just how many of your belongings will be travelling with you until they’re all loaded up. Also, more importantly, you may not know that they can become a hazard when you’re driving. So what should you do when fitting everything into your car and what should you check on your car for the long journey ahead when it’s packed to the rafters? You can make the most of your boot space by adding empty boxes, shopping bags or plastic crates, and packing in items that are likely to easily get lost or roll around the boot. Plus, this will help you when you come to unload your belongings; picking up a box or bag will be easier than going back and forth to your car, and loading up your things in your arms. If you don’t have any passengers that will be sitting in the back, then put down your back seats if you can, to create a big open space. Although you’ll be able to pack more in, this doesn’t mean you should fill it to the roof. This will obstruct your view out of your rear window and side windows, which will be dangerous. If you’re involved in an accident, any items that are laid loosely on top of things stacked near the roof of your car can come flying to the front when you brake suddenly, potentially causing you to get injured. This also applies if you decide not to fold your seats forward and intend on using your parcel shelf; even though it is tempting to use this space, it is dangerous to do so. When loading your car with heavy things it’s a great idea to put these in first, and, if possible, low down in the rear footwells. This will help to keep them steady, and support them throughout the journey. If you aren’t folding your seats down and your rear footwells are full, then place any items that are heavy up against the rear of the back seats, to help minimise any movement during your drive. As you’ll be travelling with a heavy load, it’s be a good idea to check your tyre pressures and pump them accordingly to help the car cope with the extra weight. The weight of the car when fully loaded may also alter its handling. Be sure to keep to a suitable, steady speed and avoid harsh braking and acceleration, especially as the car’s stopping distance will have increased under the weight. Something you may not have thought about is that there is a maximum weight that you are allowed to have in the car. The Maximum Authorised Mass (MAM) or Maximum Permitted Weight includes the total weight of the car, everything on the car and everything that is inside of it. You can find out how much your car is allowed to hold on the “VIN” plate, which is located in either your handbook or under the bonnet. Make sure your oil is topped up, and you have enough coolant and screen wash for your long journey. As you’ll be carrying a heavy load, the car will use more fuel; because of this, expect that you might have to make an extra fuel stop on your journey. When you’re driving long distances, with or without a car full of stuff, you should plan in regular travel stops. This will prevent you from feeling weary and tired while you drive. Plan breaks for food and drinks, to stretch your legs, toilet breaks, or even a twenty minute nap if you are feeling tired. If you do start feeling tired, and find your concentration isn’t as sharp as it should be, stop at a service station, drink a coffee and snooze for 20-30 minutes to help let the coffee get into your system. Alternatively, if you have a passenger that is insured on your car and has a full licence, then you could both take it in turns to drive if you know you’re going to be on the road for a long time. Planning in stops may mean that it takes a little longer to reach your destination but it will be safer for you, and will help to break the journey up.